Here comes another blog about 2014. 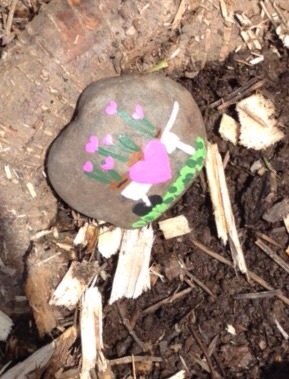 I wrote about the tree planting on March 21st, the anniversary of Susie’s death, but there were lots more plantings throughout the year. I’m going to write a little about the plantings in each month. I want the world to know about the wonderful events and the wonderful people I met. 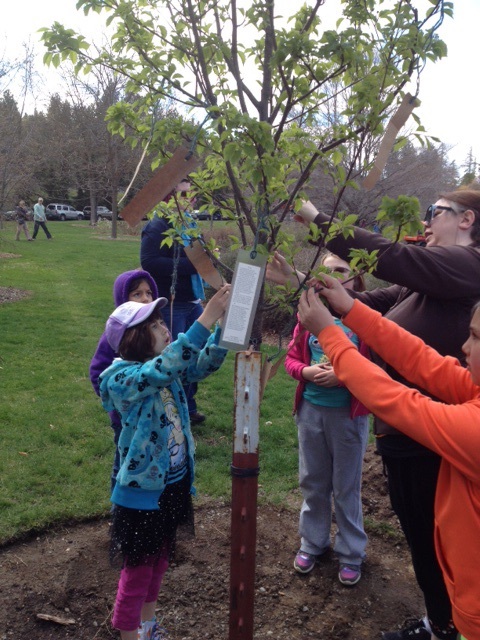 Usually the next tree is for Susie’s birthday, but this year the Woman’s Club planted a yellowwood the week before. It was a street tree and it was fun to watch as the cars came down busy Walnut Street and glanced at us hanging the tree-grams. Susie’s birthday tree, a Japanese Pagoda, was just me and the Urban Forestry crew. They’ve always been there for me. 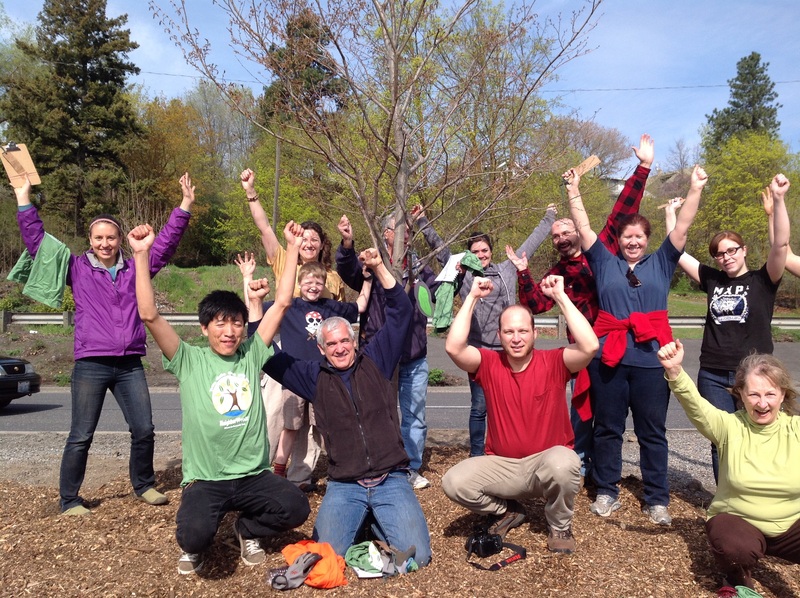 There I was with the planting team again at the Arboretum on Arbor Day planting a Korean Mountain Ash. The offer of tree Kibbles brought some Girl Scouts away from the other activities. Then I went with them along the stream and got my hands dirty helping them plant a small grove. Now I count groups of trees as groves when the individual trees don’t have a person or event connected with them. And there was a grove of trees planted in a bare traffic island by the Emerson/Garfield neighborhood. 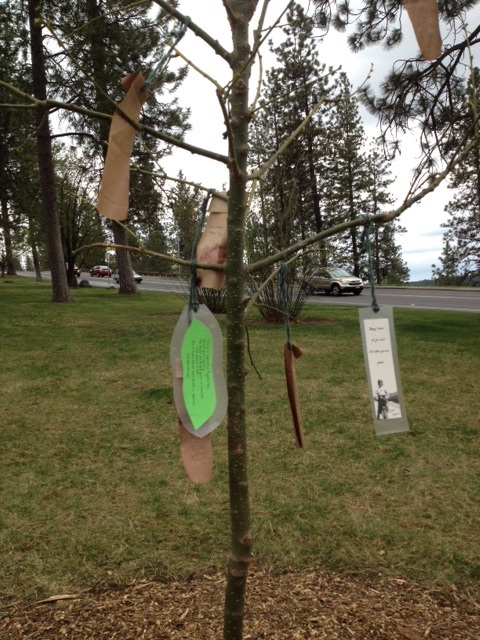 So in April 2014 Spokane tree #256 and Spokane grove #5 were planted.